<h2>Can we produce enough green hydrogen to save the world? </h2><br /><p>'Hydrogen and fuels derived (from it) is capable of reducing the carbon dioxide emissions from fossil fuels in the very, very long term, down to zero,’ said Klaus Scheffer, project manager at Siemens. ‘You don’t need fossil energies in a future world. I hope my kids will see that.’</p> <p>The technology is green hydrogen – using an electric current to convert water into oxygen and hydrogen – and if this is powered with renewable energy then it produces no carbon emissions. If this is, in turn, used to provide a clean source of fuel for industry or to balance the electricity grid, it could help alter the future of the planet.</p> <p>The main problem so far has been how to make hydrogen in large quantities cleanly. Currently, about <a href="https://www.weforum.org/agenda/2018/05/this-forgotten-element-could-be-the-key-to-our-green-energy-future-heres-why/" target="_blank" rel="noopener noreferrer">96 percent of global hydrogen</a> is produced by reforming methane, which produces carbon dioxide as a waste product. 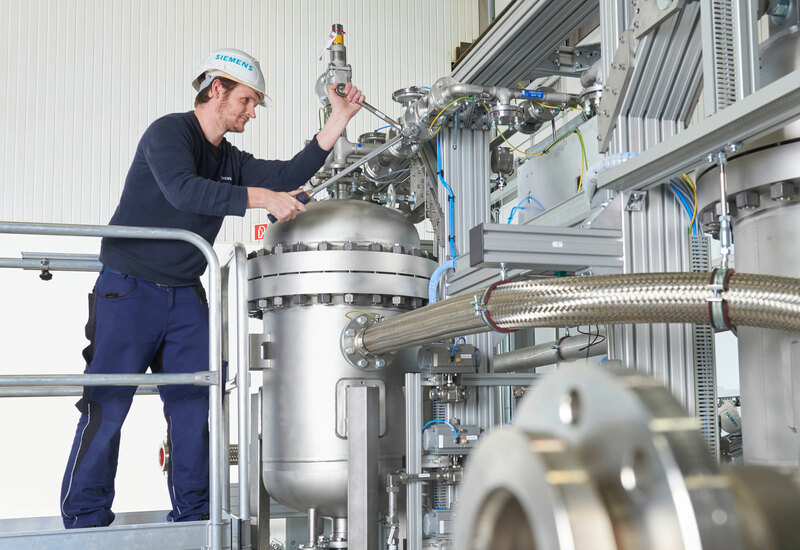 Green hydrogen produced with this electrolysis method, however, is a much cleaner alternative.</p> <p>Scheffer is helping to create a source of green hydrogen for use at a steel plant in Linz, Austria, as part of a project called <a href="https://cordis.europa.eu/project/rcn/207465_en.html" target="_blank" rel="noopener noreferrer">H2FUTURE</a>. The goal of this project is not just to produce green hydrogen from renewable energy, but to see if it can in turn be used to produce steel with a lower carbon footprint, dubbed green steel.</p> <p>‘Steel production is one of the industries which are dominating the carbon dioxide emissions in the world,’ said Scheffer. ‘The steel production process applied in Linz uses loads of coal for steel production, (so there are) a lot of carbon dioxide emissions.’</p> <p><strong>Viable</strong></p> <p>The first step of this project is to test if the technology is viable for commercial use – the electrolyser is set to begin full operations in spring 2019. Running at a capacity of six megawatts, the plant will produce about 1,200 cubic metres of green hydrogen an hour when it is fully operational.</p> <p>It is admittedly a small test – the electrolyser will reduce just a fraction of carbon emissions at the plant. But this is only a pilot project, with designs on scaling this up for bigger hydrogen production in future, using an electrolyser running at a capacity of 100 megawatts.</p> <p>Near Cologne in Germany, meanwhile, under a project called&nbsp;<a href="https://cordis.europa.eu/project/rcn/213072_en.html" target="_blank" rel="noopener noreferrer">REFHYNE</a>, ITM Power is developing a ten-megawatt electrolyser&nbsp;which will begin operations in 2020. It is being installed on the Rhineland refinery, operated by Shell Deutschland Oils, which currently relies on steam reforming to produce hydrogen.</p> <p>This is Germany’s largest refinery, consuming about 180,000 tonnes of hydrogen a year. The new electrolyser will provide a modest amount of hydrogen towards this total – about 1,300 tonnes a year. But if the trial is successful, then the technology could be expanded.</p> <p> <div class="quote-view quotesBlock quote_horizontal"> <div class="quotesTop"><img src="https://horizon-magazine.eu/sites/all/themes/horizon/images/quotes_top.png" alt="" title="" /></div> <p>‘Steel production is one of the industries which are dominating the carbon dioxide emissions in the world.’</p> <blockquote><p>Klaus Scheffer, Project Manager, Siemens</p></blockquote> <div class="quotesBottom"><img src="https://horizon-magazine.eu/sites/all/themes/horizon/images/quotes_bottom.png" alt="" title="" /></div> </div> </p> <p>Aside from producing hydrogen, REFHYNE has another purpose that helps make a business case for its use. The electrolyser can be turned on or off very quickly, meaning it can provide a grid balancing service to cope with periods of high or low demand in the electrical grid.</p> <p>‘The utility (companies) need to balance intermittent renewables with base plants,’ said Dr Frithjof Kublik, senior consultant for business development at the Rhineland refinery. ‘The electrolyser has the advantage that it can turn on or off very fast, in a few seconds, and from that point of view you can offer a grid balancing service.’</p> <p>Grid balancing services benefit from flexibility, which ‘the utility company is willing to pay a price for,’ said Kublik.</p> <p>It’s also something being investigated in Denmark, where a project called <a href="https://cordis.europa.eu/project/rcn/199464_en.html" target="_blank" rel="noopener noreferrer">HyBalance</a>&nbsp;has developed a demonstration plant in Hobro that produces hydrogen from water electrolysis when the amount of electricity being produced by renewables exceeds that needed by the grid.</p> <p>‘The project is really to test how we can use the renewable energy from the grid and transform it into hydrogen, that can be used either in industry or for energy applications,’ said Caroline Le Mer, Hydrogen Energy Europe Director at Air Liquide, which coordinates the project.</p> <p><img title="Image credit: Horizon" src="https://horizon-media.s3-eu-west-1.amazonaws.com/s3fs-public/IMCEUpload/factoid_1.jpg" alt="Image credit: Horizon" width="1980" height="668" /></p> <p><strong>Spikes</strong></p> <p>The plant opened in September 2018 and will run for 15 years, using the same electrolysing process as H2FUTURE and REFHYNE to produce hydrogen, which is known as proton exchange membrane (PEM) electrolysis. More traditional electrolysers rely on alkaline electrolysis, but PEM is advantageous as it can deal with spikes in supply, such as from renewable energies like wind and solar.</p> <p>That’s particularly useful in Denmark, where wind power is abundant – in 2015, 42% of its electricity was <a href="https://www.theguardian.com/environment/2016/jan/18/denmark-broke-world-record-for-wind-power-in-2015" target="_blank" rel="noopener noreferrer">produced by wind power</a>. At the HyBalance demonstration plant, this is used to produce hydrogen when electricity levels are low, such as at night, or when wind levels are high.</p> <p>The gas is either sold to industry or used for powering hydrogen cars, with the overall goal being to show that hydrogen can be produced in large enough quantities via renewable energy to be useful to industries.</p> <p>At a later stage, the hydrogen could be kept in salt caves for future use – a low cost way to store large quantities.</p> <p><em>The research in this article was funded through the Fuel Cells and Hydrogen Joint Undertaking between the EU and industry. If you liked this article, please consider sharing it on social media.</em></p> <br /> <img src=”http://www.google-analytics.com/collect?v=1&tid=UA-40077089-1&cid=can-we-produce-enough-green-hydrogen-to-save-the-world-&t=event&ec=republish&ea=read&el=can-we-produce-enough-green-hydrogen-to-save-the-world-&cs=republish&cm=republish&cn=republish&cm1=1" /> This post <a href="https://horizon-magazine.eu/article/can-we-produce-enough-green-hydrogen-save-world.html">Can we produce enough green hydrogen to save the world? </a> was originally published on <a href="https://horizon-magazine.eu/">Horizon: the EU Research &amp; Innovation magazine | European Commission</a>. Governments at the COP24 climate change conference in Katowice, Poland, which ends on 14 December, should tackle fossil-fuel reliance by building a global energy grid that connects renewable energy from all around the world - and the best place to start is with a giant wind farm in Greenland, says Professor Damien Ernst, an energy scientist from the University of Liège, Belgium.